Martina Navratilova is a former Czechoslovak and later American tennis player between 1978-1987 World tennis number one for 311 weeks, which is the second longest period in the first place WTA rankings (after Steffi Graf ). 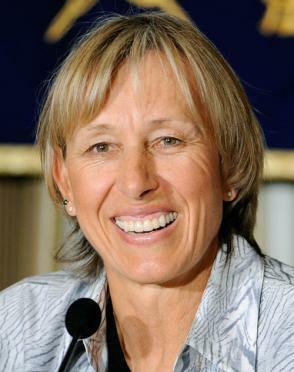 Read here to know more about biography and tennis Career of Martina Navratilova. Martina Navratilova born on October 18, 1956 in Prague, Czechoslovakia. Her parents divorced when Martin was three years. Jana's mother in 1962 married Miroslav Navrátil, who became her first tennis coach. Martina Navratilova is considered one of the best tennis players of all time. In total she won 59 Grand Slam tournaments, 18 singles, 31 women and 10 mixed doubles, which she among women has historically ranked second place. Among all tennis players hold the absolute record number of tournaments won, and 167 in singles and 177 doubles. It is one of three tennis players of history that have a complete set of Grand Slam titles in all competitions all four Grand Slam singles tournaments. When Martina's number one player of Czechoslovakia had become, she decided in 1973 to join the professional circuit. This involved, among other races in the United States to play. The government of Czechoslovakia, however, constantly threatened her not to grant exit visas because they are too liberal ideas nahield. That was why in 1975 after the U.S. Open does not return to her homeland and asylum in the United States to apply. One month after the tournament she had a residence permit. On 10 July 1978 Navratilova was the first number one in the world after the tournament of Wimbledon have won. Her performances in those days they had variable and sometimes hard to control her emotions, making them unnecessarily lost games. In the early 1980 Navratilova great successes as a result of a new training program focused on the development of muscular strength, endurance, technical precision and a good diet. They thus reached the level of American Chris Evert (1954) the late seventies had dominated women's tennis. There was a rivalry between the two players who many years women's attractive. Especially their opposite styles of play were there to blame. While Martina spectacular serve-volley game and showed notable for its simple backhand, Evert from Chris excelled at just phenomenal baseline game . From 1973 to 1988 the girls played together 80 times, including 60 finals and 14 grand slam finals. An absolutely unique. Navratilova won 43 times. In August 1987, the German Steffi Graf (1969) first number one of the world and heralded a new phase in Navratilova's tennis career. They had to go up against a new generation of players, although not her experience had, but her condition or in their youth surpassed. In 1994 she set an end to her singles career after that season still two finals have achieved: Rome and Wimbledon. She lost both finals of the Spanish Conchita Martinez (1972). She was in 1995 and 1996 still have a few mixed doubles tournament appearance. After the end of her tennis career was Navratilova in the spotlight by the publication of several books, including three crime novels co-authored with Liz Nickles, her column in the newspaper USA Today, her role as commentator at tennis matches and cooperation to the commercials. Her commitment to the gay movement did not go unnoticed. She is a co-founder of the Rainbow Card, a credit card company with ten percent of the proceeds benefit a fund for initiatives by gay organizations. She also speaks regularly about the importance of coming out and draws attention to equal rights for heterosexuals and gay men. In the spring of 2000 Martina announced her return to the professional tennis circuit. Although her ​​intention to participate in the big double tournaments with some skepticism was received, a large part of the audience enthusiastically living legend that they cut back on the track. Her comeback was not unsuccessful. She reached between May 2000 and August 2005 23 finals and won 14 of them. With doubles partner Leander Paes (1973) she had the most success: they won in 2003 both the Australian Open and Wimbledon, in 2004, were again in the final of the Australian Open in 2005 and the final of Roland Garros. In the women's doubles she got together with Russian Svetlana Kuznetsova (1985) the final of the U.S. Open in 2004 and reached the quarterfinals that year of the Olympics with Lisa Raymond (1973). In 2004 she made ​​her comeback in the women's singles. At Roland Garros , she lost in the first round, but at Wimbledon she reached the second round yet. In 2005 she won with Anna-Lena Grönefeld the doubles of Toronto. Critics say that the fact that Navratilova after her fortieth still so successful in the doubles, showing that the double is not really taken seriously. Martina won her entire career, however, 175 doubles titles. Navratilova is her long career holds more records, including the most won singles titles (men and women), most doubles titles, the longest uninterrupted series wins (74), the most played singles finals (227) and the oldest winner of a WTA title (48 years and 10 months).On 9 September 2006 took Navratilova (again) goodbye, and in style. She won, along with Bob Bryan , the mixed-doubles at the U.S. Open. It was her 59th Grand Slam title.